Over the past decade, Dan Boeckner has earned his place in the upper echelons of the Canadian indie music scene, and his work with Wolf Parade, Handsome Furs and Divine Fits has brought him to the point where he could pack il Motore on little else but his own clout. Fresh off a three-night stint at Toronto's Canadian Music Week and purportedly one of the worst hangovers ever, courtesy of birthday boy Jonathan "Beaver" Sheppard of glam synth duo Country (the night's opening act), Boeckner's new band didn't let their fatigue impact their set. 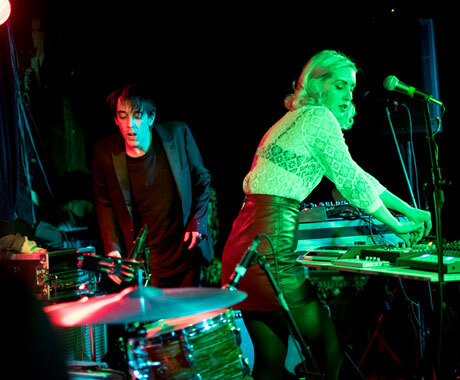 While Operators recorded their record in Montreal's Hotel2Tango studio earlier this year, this was their inaugural public performance in the city, and the trio — rounded out by fellow Divine Fits member Sam Brown on drums and "ex-Macedonian" Devojka handling a vast array of electronics — made their live Montreal debut one to remember. Featuring gurgling electronics occasionally reminiscent of early Unicorns, blasts of synths and steady drums, the new material brought Boeckner's pop tendencies into full view, and he seemed genuinely relieved to see the crowd's positive, dancing reaction, thanking them profusely throughout the set. He noted the unorthodoxy of playing a show before releasing the music, but was adamant that the music was best introduced live. While the usage of electronics was occasionally reminiscent of Boeckner's old synth-led project Handsome Furs, they were much less overwhelming with Operators, and worked well in their comparatively muted capacity thanks to Brown's live drums. Without his guitar, Boeckner — or Dr. Chocolate, as he called himself late into the night — seemed physically liberated, hopping and jumping on stage in time with the music. He looked overjoyed to finally be revealing the much murmured-about project, and his lyrical delivery was passionate and clear. Devojka made sense of a confusing plethora of gadgets and gizmos to provide the electronic backbone of the music; there was a technical malfunction in the lead-up to the set's second song, which was started and restarted no fewer than four times thanks to a difficult piece of equipment Boeckner called "the fourth member of the band." The set's fourth song was an early standout, including a rare appearance from Boeckner's guitar. Brown kept a strong backbeat with a flurry of drums as Boeckner hollered about "the shape of things to come," before the song took a sharp right turn into a guitar-driven finale, featuring a repetitive shout of "born to let them go." Even without any prior knowledge of the songs, audience members were able to sing along to the repeated choruses throughout the night, a testament to the catchiness and infectiousness of the tunes. After a set closer that featured pointillist electronic bleeps, the trio returned for a two-song encore. The first song featured the repeated line "you better start again," and while there's no evidence as to what Boeckner was singing about, one could surmise that it referred to Boeckner beginning anew after the dissolution of Handsome Furs, Wolf Parade, and his marriage to former Handsome Furs partner-in-crime Alexei Perry, along with going back to square one in his second new band in two years. The night's final number was more than indebted to LCD Soundsystem's "Dance Yrself Clean," featuring glitchy minimalist electronics followed by several blissful build-ups, but later blossomed into an exultant climax with triumphant choral synths to finish the night. Boeckner, Brown, and Devojka have crafted something great, and left a satisfied crowd anticipating their forthcoming debut LP.